several times. I heard that Wayne Chamberlin was here when I first came back this fall so I went to the Marine P.O. to try to locate him and they informed me that he had just left a couple of days before and the worst part of it was that he went to the Island that I had just returned from, so you see how it is. 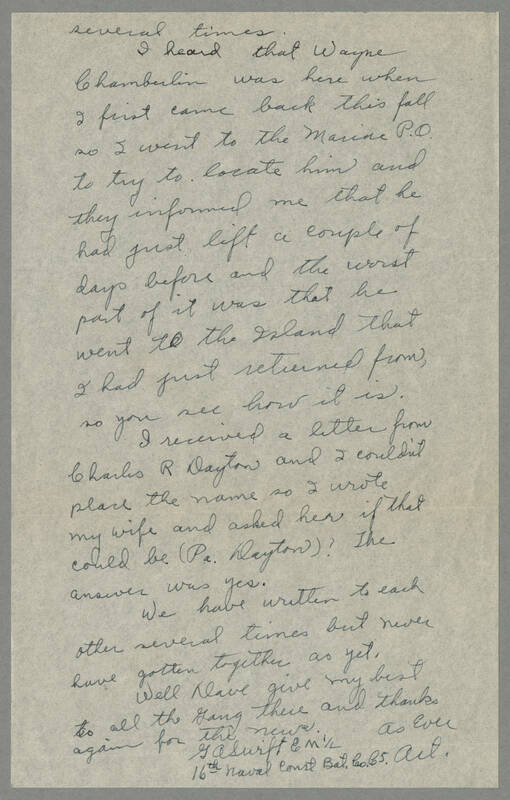 I received a letter from Charles R Dayton and I couldn't place the name so I wrote my wife and asked her if that could be (Pa. Dayton)? The answer was yes. We have written to each other several times but never have gotten together as yet. Well Dave give my best to all the Gang there and thanks again for the news. As Ever Art G A Swift E M 1/L 16th Naval Const Bat. Co C5.